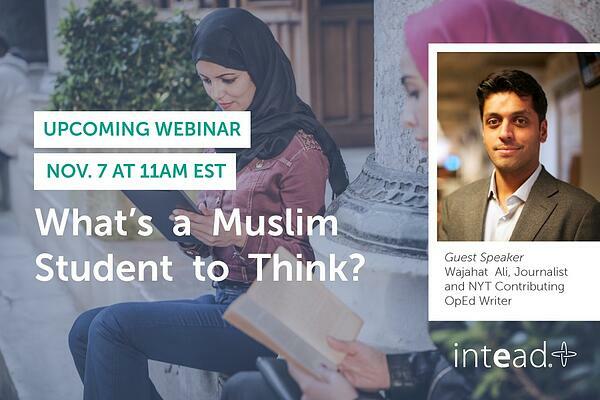 Webinar: What's a Muslim Student to Think? On November 7 at 11AM EST, Ben (Intead) and journalist Wajahat Ali (CNN, New York Times, Al Jazeera America, 2015 AIEA Keynote speaker) will discuss recent swings in student mobility patterns from Islamist regions and their experiences while studying in the U.S.
What's a Muslim Student to Think? will be a clear-eyed and important discussion about what Middle Eastern and Southeast Asian students are considering as they evaluate post-secondary school options. This webinar will specifically focus on the multifaceted Muslim American experience and how that informs international student recruitment efforts. Register to Attend the Webinar!